The Boxby Multi Snack Pack contains six different types of Boxby dog snacks in 25g packs. The snack pack contains the following treats: Chip Mix, Calcium Bone, Boxby Bone Snack, Boxby Strips, Boxby Chicken Snacks, Boxby Rice Bone. You can surprise your dog by giving him different snacks from the Boxby range! 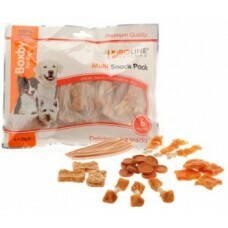 You can also use the Boxby Multi Snack Pack to see which snack your dog favours. A bone outside with dried chicken breast. The name of this product covers the most important component, namely calcium, on. As you know, calcium is important for strong bones and teeth. A cams made from natural, dried beef skin and on each side of the bone-dried chicken meat. Meat and animal derivatives (100% Chicken), and fish by-products (90% pollack), vegetable protein extracts, minerals. Meat and animal derivatives (100% Chicken), vegetable protein extracts, minerals. Crude protein 58.0%, crude fat 1.5%, ash 7.5%, crude fiber 1.0% moisture 18.0%. Meat and animal derivatives (100% Chicken), rice, vegetable protein extracts, minerals. Crude protein 52.0%, crude fat 2.0%, ash 4.0%, crude fiber 1.0% moisture 15.0%.